Knowing that you are running for a worthy and meaningful cause, as well as the gentle prodding from your teammates, will help push you to the finish line. 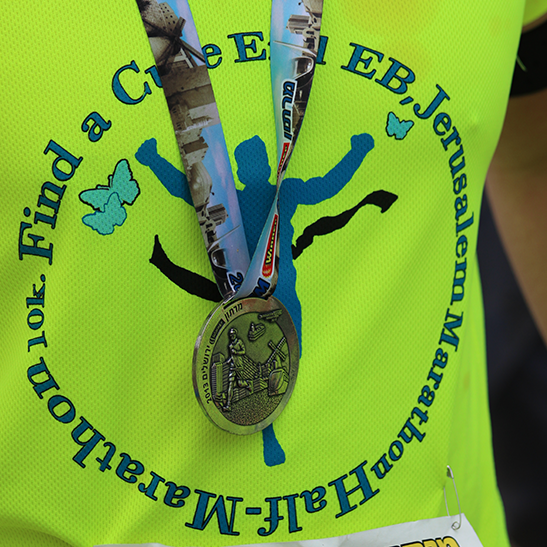 The Jerusalem Marathon runs through the distinctive streets of Jerusalem, creating a route filled with both the historic and modern wonders of Jerusalem. The landmarks along the way give both inspiration and encouragement throughout the run. Team Butterfly runners commit to raising a minimum of $600, all of which goes toward funding medical research for a cure to EB as well as providing crucial services to those with EB and their families. Knowing that you are running for a good cause as well as your teammates gentle prodding will help push you to the finish line. The sense of achievement upon finishing is one that will have a lasting impact on your life. Joining Team Butterfly will be the smartest decision you have ever made!